Luxurious hand knit socks - keep your feet always warm! Socks for him. Hand knit cable wool socks. Mens wool socks. Aran knit socks. Cable knit. Tweed wool socks. Warm socks for men. Gift for him. Lace boot socks. Knee high socks. Leg warmers. White Christmas. Gift for her. Lace socks. Wool socks. Boudoir socks. Rustic. Winter wedding. White wool socks. Luxurious hand knit wool socks. White lace socks. Beaded edge. Sleep socks. Bed socks. Boudoir. House socks. READY to SHIP. Unisex size EUR 37. Hand knit tweed wool socks. Autumn winter accessories. Christmas unisex gift. Warm house or bed socks. Hand knit wool socks with CASHMERE. Cashmere socks. Pale pink. Old rose wool lace socks. Gift for her. Lingerie socks. Bed socks. Oatmeal boot socks. Beige knee high socks. Hand knit leg warmers. Gift for her. Lace socks. Wool socks. Country socks. Rustic. Hand knit wool socks. Lace socks. Spring green socks. Leaf pattern. High quality sock yarn. Autumn, fall winter accessories. Intricate wonderful lace pattern socks. Beige ladies lace socks. Gift for her. Hand knit luxurious socks. Boudoir socks. House or bed socks. Heavenly soft blue wool socks. Lace socks. Pastel blue lace. Luxurious hand knit socks. Bed socks. House socks. Boudoir. Boot socks. Knee high socks. Leg warmers. Hand knit socks. Lace socks. Wool socks. Gift for her. Christmas gift. Bed socks. Boudoir socks. Wool socks. Hand knit lace socks. 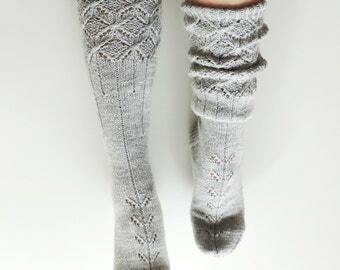 Luxurious pastel warm grey hand knit socks. Bed socks. House socks. Autumn winter. Cozy gift for her. Wool socks. Hand knit lace socks. Luxurious oatmeal beige hand knit socks. Bed socks. House socks. Autumn winter. Christmas gift for her. Hand knit lace socks. Wool socks. Lace socks. Elegant hand knit leaf lace socks. Highest quality sock-wool. Bed socks. House socks. SAMPLE SALE! Ready to ship EUR 37 Deep brown cable socks. Chocolate brown socks. Hand knit luxurious socks. House or bed socks. Luxurious pastel lavender lilac hand knit socks. Wool socks. Hand knit lace socks.Bed socks. House socks. Autumn winter. Cozy gift for her. Beautiful wool socks. Lace socks. Luxurious hand knit socks. Highest quality sock-wool. House socks. Autumn winter. Christmas gift. Luxurious hand knit lace socks. Soft and durable wool socks. Lavender lace socks. House socks. Bed socks. Hand knit wool lace socks. Diamond geometric. Gift for her. Royal blue. Deep blue. Geometric. Autumn winter accessories. House socks. Luxurious hand knit wool socks. Intense turquoise. Autumn winter accessories. Made to order. Gift for her. Bed socks. Boudoir. House socks. Beige hand knit wool socks. Knit gift for her. Lace socks. Oatmeal beige lace. Hand knitted socks. Bed socks. House socks. Boudoir. Hand knit socks. Pastel grey ladies lace socks. Christmas gift for her. Hand knit luxurious women socks. Boudoir, house or bed socks. Ladies lace socks. Hand knit luxurious socks. Highest quality sock yarn. Boudoir socks. House socks. Bed socks. Sleeping socks. Dark grey boot socks. Grey knee high socks. Hand knit leg warmers. Gift for her. Lace socks. Wool socks. Boudoir socks. Rustic. Hand crafting and super soft ! Lovely! I will treasure them for years to come! The sweater is cozy and gorgeous! Grieta does great work and quickly. Custom listing for Lynne. An oversized drop hem raglan sweater. She is a lovely seller, kind and helpful. definitely the best socks here on Etsy. So beautiful patterns, and made with high quality durable materials. I will definitely buy from her again! I learned to knit when I was 7 years old. I remember myself trying to impress my Grandpa by showing him how quick I am in casting on! :D He didn’t much care. My most favorite knit work is socks. They are small enough not to get boring, but complicated enough for my need of challenge. I have tried hundreds of methods and patterns. At one point all the friends and family members became over-knitted. I had to expand! Now I knit for my Etsy shop (and some very special friends and relatives who ask for new socks). I love finding new patterns. I search the web and my collection of pattern books looking for new ideas. There are unlimited design possibilities. I am an architect and interior decorator. I have always worked for myself. Some time ago I moved to Netherlands to support my partner's decision to change his career. Since year 2014 we are back home, in Latvia - where we truly belong.